Pullover construction. Soft and Lightweight. Clean with no flaws. Length - 23.5". 100% Wool. 3/4 Length Sleeves. Chunk knit. Wash Instructions: Dry Clean. Chest: 18". Hey guys glad you found us! Length: 20". 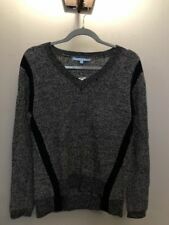 Antonio Melani Brown Sweater Womens Size Small. Flat measurements: Armpit to armpit is 16.5" Length from shoulder to bottom is 22" Gently used with no flaws. Please see photos for more details. Every maker & every sweater is sized differently. Fuchsia pink, gray, beige. Solid top striped bottom. Sleeve Length: 27". Length: 26". Shoulders: 15". Item is in normal used condition with no tears, stains, holes. Size small. Very soft and comfy. Snap button closure. Maybe worn once. Pit to pit is 19 in (when snap is closed) Length is 17.5 in and sleeve length is 23 in. This length is so flattering. Great with jeans and boots. Python print very clean over all good condition. This is a great sweater. There is a small Mark on the front of sweater. Total length approx. 49% VISCOSE NYLON 6% LYOCELL. MATERIAL - 70% Silk, 30% Cotton, Shoulder is 100% Silk. COLOR - Blue. 70% Acrylic 30% Wool. collar and waist have a band. It is in gently worn condition. Chest/Bust 36. Shoulders 14. I want you to find that feeling and bring back that spirit here. Lets touch upon. It is not right or fair to that person. It is such a beautiful design and perfect for any occasion. Imagine how great you'll look wearing it! Length (shoulder to hem): 22.5”. Sleeve Length: 23”. Bust: 17.5”. Sleeve length from shoulder: 24.5 in. Length from the top of the shoulder to the hem: 24.5 in. All our clothes are clean and in very good used condition. I will do my best to fix any concerns and make you happy. Condition: 9/10 Pre Owned, very good fabric doesn't show wear.